The start of the NFL season was nothing short of thrilling. An exciting mix of stand-out rookies and well-performing veterans made Week 1 a fantastic first week of football. In the 16 games played, there were a combination of complete blowouts, nail-biters, and surprisingly, even a tie. The regular season began on Thursday, September 6th. Only two teams, made their season debut on Thursday Night Football. The following Sunday, August 9th, was a jam-packed day of football, with twenty-six teams battling against one another for their first victory of the season. Four awaiting teams went head-to-head on Monday, August 10th. Thursday Night Football began with the Philadelphia Eagles, reigning Super Bowl champs, facing-off against the Atlanta Falcons at Lincoln Financial Field. While the status of the Eagles’ starting quarterback in the 2017 regular season, Carson Wentz, is still somewhat unknown due to his torn ACL and LCL injury last December, Nick Foles and the Eagles were able to get the job done in Week 1. Although the Falcons made a ferocious run down the field in the final two minutes of the game, the Eagles’ defense was able to shut them down, securing an 18-12 victory. 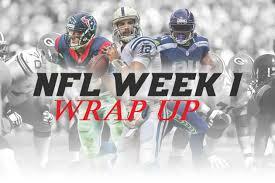 There were a few big blowouts on Sunday, the biggest being the Buffalo Bills’ win against the Baltimore Ravens, 47-3. The Bills’ offense, led by rookie quarterback Josh Allen, struggled to make completions and find openings around the Raven defense. The Ravens were strong on both sides of the ball, as veteran Joe Flacco had 25 completions for 236 total yards and 3 passing touchdowns. The Raven defense forced 2 interceptions and only allowed the Bills to reach the red zone one time throughout the entire game. The Pittsburgh Steelers and Cleveland Browns had a very different outcome than the Bills/Ravens as they ended in a 21-21 tie. A controversial call on a punt return in the fourth quarter allowed the Browns to tie the game up in the last eight minutes. Neither team could score in the 10-minute overtime and the game ultimately ended in a tie. Browns’ rookie cornerback and No. 4 overall pick in the draft, Denzel Ward, had two interceptions and was in turn named the NFL rookie of the week. The New England Patriots, Super Bowl runner-ups, played well to defeat the Texans 27-20. The Green Bay Packers lost a close game against the Bears 24-23. The Dallas Cowboys struggled on the offensive end as they had zero third down conversions in the first half, which contributed to their 8-16 loss against the Panthers. The New York Giants, still trying to figure out their offensive flow under new head coach, Pat Shurmer, were beaten by the Jacksonville Jaguars 15-20. Rookie running back Saquon Barkley (No. 2 in the overall draft) gave the Giants a sliver of hope with a 68-yard touchdown with 10 minutes left in the game. Yet, they failed to score in the remainder of the game. One of the most surprising outcomes of Week 1 was the Tampa Bay Buccaneers’ victory over the Saints. Buccaneers’ 2017 starting quarterback, Jameis Winston did not play as he is suspended until Week 4. However, backup quarterback and 14-year veteran, Ryan Fitzpatrick, was able to lead the Buccaneer offense to narrow victory, 48-40. On Monday, a stand-out performance from Jets’ rookie quarterback Sam Darnold helped the New York Jets defeat the Detroit Lions by a staggering score of 48-17. Darnold had 16 completions for 198 yards. Running backs Isaiah Crowell and Bilal Powell contributed to the Jets’ victory with a combined total of 162 rushing yards with 2 touchdowns. In the final game of Week 1, the Oakland Raiders, lead by new coach Jon Gruden, lost to the Los Angeles Rams 13-33. As teams look to continue their success or avoid an 0-2 start, Week 2 is sure to be filled with much more exciting games and great matchups.